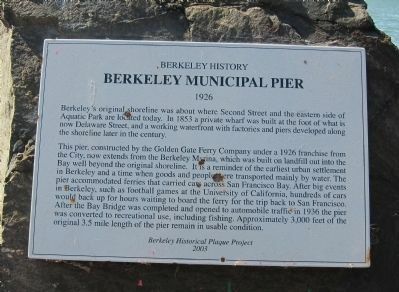 Berkeley's original shoreline was about where Second Street and the eastern side of Aquatic Park are located today. In 1853 a private wharf was built at the foot of what is now Delaware Street, and a working waterfront with factories and piers developed along the shoreline later in the century. 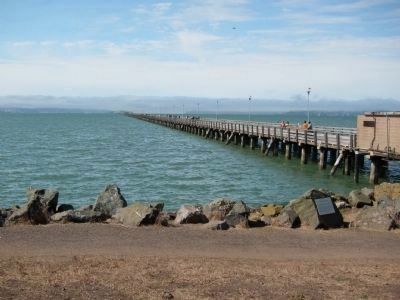 This pier, constructed by the Golden Gate Ferry Company under a 1926 franchise from the City, now extends from the Berkeley Marina, which was built on landfill out into the Bay well beyond the original shoreline. It is a reminder of the earliest urban settlement in Berkeley and a time when goods and people were transported mainly by water. 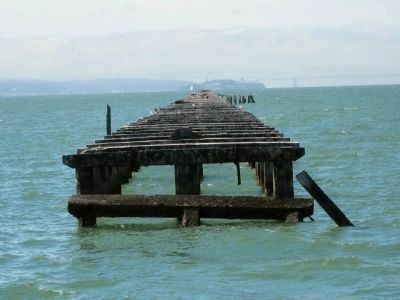 The pier accommodated ferries that carried cars across San Francisco Bay. After big events in Berkeley, such as football games at the University of California, hundreds of cars would back up for hours waiting to board the ferry back to San Francisco. After the Bay Bridge was completed and opened to automobile traffic in 1936 the pier was converted to recreational use, including fishing. Approximately 3,000 feet of the original 3.5 mile length of the pier remain in usable condition. The marker is visible on the right, mounted to a low rock. Erected 2003 by Berkeley Historical Plaque Project. Location. 37° 51.764′ N, 122° 19.049′ W. Marker is in Berkeley, California, in Alameda County. Marker is at the intersection of Seawall Drive and University Avenue, on the right when traveling south on Seawall Drive. Touch for map. Marker is in this post office area: Berkeley CA 94710, United States of America. Touch for directions. Other nearby markers. At least 8 other markers are within 2 miles of this marker, measured as the crow flies. Spenger’s Fish Grotto (approx. one mile away); Harpoon Cannon (approx. one mile away); Delaware Street Historic District (approx. 1.1 miles away); Workingman’s Hall (approx. 1.2 miles away); Bowen’s Inn/Higgins Grocery (approx. 1.2 miles away); Site of Pump House - Peet Brothers/Colgate Palmolive (approx. 1.2 miles away); Church of the Good Shepherd (approx. 1.3 miles away); Philadelphia Quartz Company (approx. 1.4 miles away). Touch for a list and map of all markers in Berkeley. More about this marker. The marker is mounted on a low rock just a few steps to the south of the foot of the Berkeley Municipal Pier. 3. 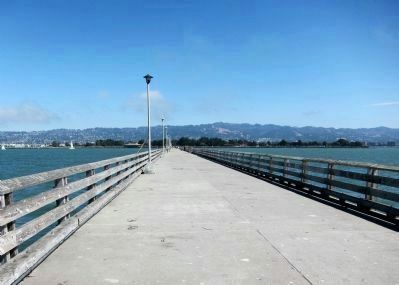 View of the Berkeley Municipal Pier, looking east from the end of the pier. The pier was originally 3.5 miles long. This view shows the 3,000 feet still remaining. This view, looking west from the end of the pier, shows the remnants of the pier that were allowed to decay after the pier was converted to recreational use. A channel wide enough to sail boats through was created between the still-in-use part of the pier and the part of the pier that was allowed to decay. Faintly visible in the background are Alcatraz Island (at the pier tip), part of the Golden Gate Bridge (to the right of the pier), and San Francisco (to the left). 5. Berkeley Municipal Pier - Looking West from the Foot of the Pier. More. 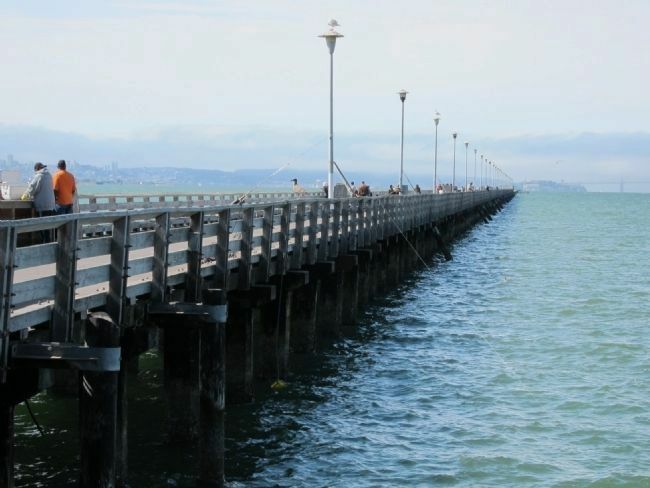 Search the internet for Berkeley Municipal Pier. Credits. This page was last revised on June 16, 2016. This page originally submitted on October 4, 2010, by Andrew Ruppenstein of Sacramento, California. This page has been viewed 1,130 times since then and 6 times this year. Photos: 1, 2, 3, 4, 5. submitted on October 4, 2010, by Andrew Ruppenstein of Sacramento, California. • Syd Whittle was the editor who published this page.